Hall of the Mountain King: Review: Blind Guardian, "Live"
If you're a fan of Blind Guardian, this two-CD collection of some of the best songs from the band's seven studio albums is a must-have. If you're not a fan, this collection of tunes fueled by fantasy and legend is a fantastic introduction. 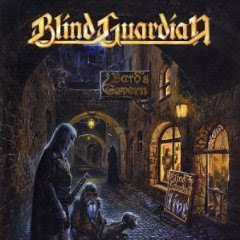 The album, recorded at venues all over Europe and Asia, show that the rest of the world knows what the American metal community is just starting to pick up on - that Blind Guardian is one of the most original and distinctive bands out there. "Live" provides a quick overview of the band's progression from a fairly straightforward power metal outfit on songs like "Majesty" and "Valhalla" to the symphonic powerhouse they've become on numbers like "Nightfall" and "The Soulforged." The focus on the album, is on the later, more complex works. They play six of the nine songs on "Imaginations From the Other Side" and five tunes from "Nightfall in Middle-Earth." The album provides more than two hours of Blind Guardian in fine form, making the smooth transition from blistering power metal to minstrel songs. It's the latter that often get the bigger reaction from the crowd. The performances are solid, the fan reaction is fantastic and it's two solid hours of Blind Guardian. What more could you ask for?